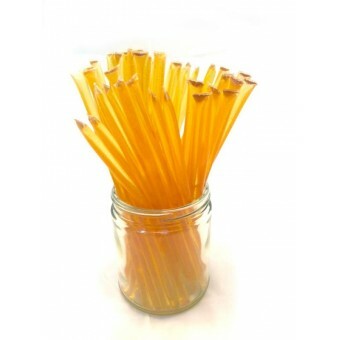 Honey Sticks are honey filled straws. They provide an easy and convenient way to transport and store honey. They keep forever …in a desk drawer, locker or kitchen cupboard. They offer quick energy for athletes, a natural sugar boost to diabetics and just-right-touch-of-honey for your coffee or tea. Each straw contains approximately 1 teaspoon of 100% pure, Grade A honey, has 4g of carbs and 15 calories per straw. To use them, cut or bit off a heat-seal end and squeeze the honey out.